The Recording Academy, AEG Ehrlich Ventures, and CBS celebrate the 40th anniversary of the landmark soundtrack to the film Saturday Night Fever with an all-star special — Stayin’ Alive: A GRAMMY Salute To The Music Of The Bee Gees — on Sunday, April 16th from 8-10 pm ET/ PT on the CBS Television Network. 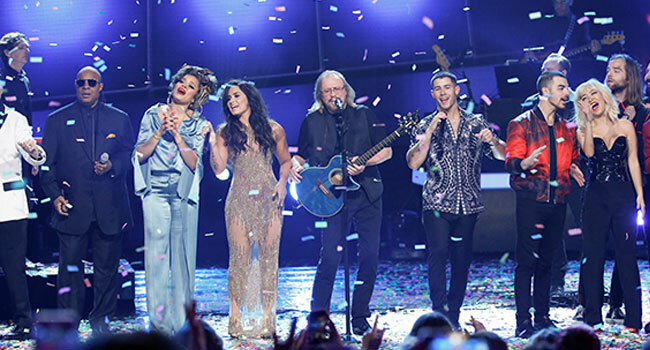 GRAMMY nominee Kelsea Ballerini, GRAMMY nominee Andra Day, singer/songwriter Jason Derulo, five-time GRAMMY winner Celine Dion , multi-platinum pop-funk band DNCE, GRAMMY nominee Nick Jonas, GRAMMY nominee Tori Kelly, 10-time GRAMMY winner John Legend, GRAMMY nominee Demi Lovato, two-time GRAMMY winners Little Big Town, three-time GRAMMY winners Pentatonix, GRAMMY nominee Thomas Rhett, GRAMMY winner Tavares, four-time GRAMMY winner Keith Urban, and 25-time GRAMMY winner Stevie Wonder pay tribute to five-time GRAMMY winners and Recording Academy Lifetime Achievement Award recipients the Bee Gees. Seven-time GRAMMY winner and Bee Gees co-founder Barry Gibb performs a selection of hits from Saturday Night Fever—Soundtrack, which won Album Of The Year at the 21st Annual GRAMMY Awards and was inducted into the GRAMMY Hall Of Fame in 2004. The memorable tribute special also features appearances by Cynthia Erivo, John Travolta, and Wilmer Valderrama. Stayin’ Alive: A GRAMMY Salute To The Music Of The Bee Gees is produced by AEG Ehrlich Ventures, LLC. Ehrlich and Rac Clark are the executive producers, Ron Basile is the producer, and David Wild is the writer.